Rhesus macaque CD4, His Tag (CD4-C52H7) is expressed from human 293 cells (HEK293). It contains AA Lys 26 - Trp 390 (Accession # G7N5T8). The protein has a calculated MW of 42.3 kDa. 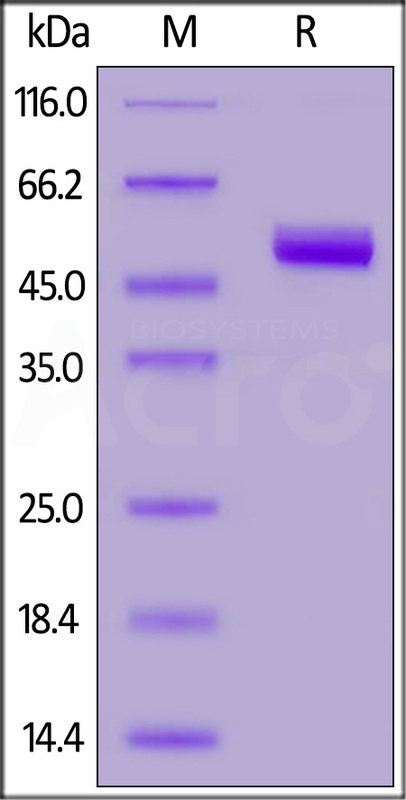 The protein migrates as 52-60 kDa under reducing (R) condition (SDS-PAGE) due to glycosylation. Rhesus macaque CD4, His Tag on SDS-PAGE under reducing (R) condition. The gel was stained overnight with Coomassie Blue. The purity of the protein is greater than 95%. T-cell surface glycoprotein CD4 is also known as T-cell surface antigen T4/Leu-3. CD4 contains three Ig-like C2-type (immunoglobulin-like) domains and one Ig-like V-type (immunoglobulin-like) domain. CD4 is accessory protein for MHC class-II antigen/T-cell receptor interaction. CD4 induces the aggregation of lipid rafts. CD4 is a primary receptor used by HIV-1 to gain entry into host T cells. HIV infection leads to a progressive reduction of the number of T cells possessing CD4 receptors. Therefore, medical professionals refer to the CD4 count to decide when to begin treatment for HIV-infected patients.